Do You Crash Here Often? 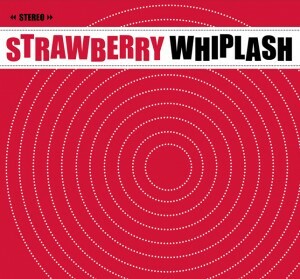 Highly anticipated debut album from Scottish noise and jangle pop enthusiasts Strawberry Whiplash! The duo’s three singles—‘Who’s In Your Dreams’ EP (2008); ‘Picture Perfect’ EP (2009); and ‘Stop, Look and Listen’ EP (2011)—have earned international admiration including strong reviews in Magnet, All Music Guide, Blurt, The Big Takeover, Sounds XP, Is This Music, and Calle 20, among others. The releases have been celebrated by countless blogs and radio shows, including ‘song of the day’ honors on influential American station KEXP and spins on national radio in the UK and Spain. ‘Picture Perfect’ has even crossed over into mainstream culture with a fan-made Youtube clip generating over 130,000 views to date. Building on the success of these singles, ‘Hits In The Car’ presents an anorak concept album narrating an evolving relationship from initial chat-up line to Dear John letter. Accordingly, it starts off bright in tone and gets progressively darker as the tracks roll on. The album has the usual influences, including The Jesus and Mary Chain, The Primitives, Lush, The Shop Assistants, Astrud Gilberto, My Bloody Valentine, and Mazzy Star. Album opener ‘Do You Crash Here Often?’ is a fuzzy pop pick-up line that recalls the melodic best of Blondie, while ‘Everybody's Texting’ is a commentary on instant messaging and the excitement of a new courtship and ‘Now I Know It's You’ is blissful shoegaze pop with especially lush production. Matching the enthusiasm of a new relationship, ‘Picture Perfect’ is a shimmering song that sets Sandra's pitch perfect vocals and Laz' chiming and fuzzy guitars to a primitive beat. A flawless slice of pop reminiscent of indie classics from The Primitives or Darling Buds, it’s a manic pop thrill that puts the 'hit' in ‘Hits In The Car’. ‘You Make Me Shine’ sees Laz stepping out for a magnificent duet with Sandra. Think Nancy Sinatra and Lee Hazlewood meets Sid and Nancy and you’re nearly there. Meanwhile, ‘Looking Out For Summer’ is an effervescent pop hit with zippy intro and Orange Juice guitars that serves as the perfect dose of audio sunshine for road trips in the convertible. ‘What Do They Say About Me?’ is catchy paranoid pop and a pivotal song on the album as it bridges the honeymoon phase of a relationship with the inevitable end. Meanwhile, ‘Dining Out In Paris and London’ is a continental rift with glockenspiel and major seventh chords. If George Orwell were alive and writing bittersweet indie pop, it might sound a bit like this. ‘Stop, Look and Listen’ is another smash hit with spirited intro, an embarrassingly catchy chorus, and driving rhythm, while ‘Another April’ is something altogether different—brooding reflective pop building to an especially tumultuous finish. Continuing in the noisy vein, ‘It Came To Nothing’ sees Strawberry Whiplash put on their pop assistants hats for a dancefloor filler with surf guitars and an extra dose of fuzz and feedback. As the album draws to a close, ‘Sleepy Head’ features Laz on lead vox in a sublime shoegaze classic with seductive beats that recall the best of the mighty Pale Saints or My Bloody Valentine, while ‘First Light of Dawn’ details the subdued ending of the relationship in fine fashion. A remarkable debut album, ‘Hits In The Car’ is thirteen smash hits for Strawberry Whiplash and another Scottish pop classic for Matinée! Tra i dischi che mi stanno accompagnando ormai fedeli da qualche mese, il debutto degli Strawberry Whiplash, Hits In The Car, è uno di quelli che non mi stanca davvero mai. Debutto poi non è una parola del tutto esatta: la band di Glasgow pubblica ep con la leggendaria Matinée Records ormai da diversi anni. Questo primo disco ufficiale infatti rappresenta più un punto di arrivo che di partenza, con un bouquet di influenze che ci prendono per la gola: Jesus and Mary Chain, The Pastels, The Shop Assistants e Pale Saints solo per citarne alcuni. Insomma, un pop molto molto ispirato ed immerso fino ai capelli nel C86, scritto e suonato davvero bene. Come la band racconta nell’intervista ad opera del nostro Luca Pasi, queste canzoni ti colpiscono come le hits in macchina, siano incidenti o canzoni belle e spietate. Un'altra band che tiene a livelli altissimi la bandiera del pop scozzese, uno dei miei dischi dell'anno. --Frigopop!